The Lost Decade, Or Was It? The gloom-and-doom crowd has already taken a stance that the 2000’s were the lost decade for stocks as evidenced by the miserable performance of the S&P 500, the most popular market-weighted benchmark for U.S. stocks. A chart of the S&P 500 from 2000-2009 backs up their point quite nicely. As the chart below shows, the S&P started the decade at 1,469 and ended it 24% lower at 1,115. Obviously, a terrible return. If we use this as evidence that investing in the 2000’s was a losing proposition, we might reach the conclusion that a passive approach to investing over the long term or a goals-based approach to investing are dead. But, there are three fundamental points that are excluded from this argument. First, the chart completely ignores dividends. Adding the dividends that the S&P 500 companies (and therefore any fund that held those companies) paid improves the return to -9% over the ten year period. Annualized, that’s -0.95% per year with dividends vs. -2.71% without. It’s still not attractive, not even positive, but much better than without dividends. Second, a look at how the last eight decades have performed gives a sense of the volatility of the stock market. The chart below shows the annualized S&P 500 return (including dividends) over each ten-year period. While the 2000’s were the worst of all the decades shown, they’re not far behind the 1930’s. Had one reached the conclusion that long-term investing was dead after 1939, the opportunity to turn $1 into $1,430 over the next 70 years with an investment in the S&P 500 would have been missed. Finally, the argument above takes a large leap in using the S&P 500 as an approximation for “investing”. Any professional asset manager (including yours truly), incorporates many other asset and sub-asset classes into an overall portfolio allocation. The ultimate selection is of course based on the return that clients need in order to achieve their goals, with the minimum amount of risk that is possible to get there. While the S&P 500 certainly performed poorly during the 2000s, and just about every asset manager would have had some component of client portfolios in large capitalization U.S. stocks (like the S&P 500), the other asset classes performed much better. 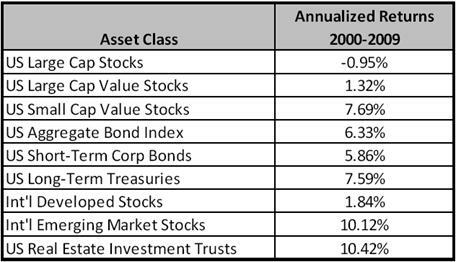 In fact, a simple indexing of equal components of each asset class shown below would have led to a 6.85% annualized return throughout the 2000’s (94% return over the 10 years!). And, what’s even better is that only two years in the 2000’s would have had negative returns. This shows the impact of having a truly diversified portfolio, as opposed to one that just contains many stocks in the same assets class (as is the case with the S&P 500). So, while large cap U.S. stocks may have had a really hard time in the 2000’s, the nearly 7% compounded returns that could have been achieved with the combination of assets above would have satisfied the 10-year goals of many investors. In other words, passive investing and goal-based investing focused on diversification seems far from dead.